I know this is too short a notice but this whole launch was organized impromptu and for the reason that we have the fortune of Shahnaz visiting India for next few days. There will be a lecture today Friday, February 26 at 3.30 pm at Ho-Chi Min Conference Room, 1st Floor, Academy of Third World Studies, Jamia Millia Islamia University by Prof. Syed Fakir Aijazuddin on "Pakistan Your Distant Neighbour" followed by Shahnaz's book launch. Shahnaz would be available to sign copies for those readers who wish to. The book has been published by Penguin Classics. The event has been organized by ICCR and Jamia Millia Islamia. For more details call Prof. Shiv Prakash on 09810086353 or me on 09873078449. Would love to see as many of you who could make it there tom. In August 2002, I had my first encounter with the Dastan-e Amir Hamza. Although I had been an avid reader of Urdu fiction and had even formally studied it for my M Phil dissertation I had never actually read a Dastan nor had I paid any heed to the genre. In that year S. R. Faruqi, the leading scholar of the form, asked me to help out somebody who was interested in making a film on the form. While the film never got made, I read the first volume of his marvelous study of the Dastan-e Amir Hamza. But it was not until 2004 that I actually attempted to engage seriously with it. I became a Sarai fellow that year with the intention of collecting material for a documentary on the tradition. It was only then that I actually approached the texts and when I did so, I found it an exhilarating experience, both as an Urdu lover as well as a theatre actor. The lines were literally crying out to be read aloud. But creating a performance was still far from my mind. During the course of that fellowship as I read more I realized that rather than looking at them merely as a literary achievement, I would have to situate them in performance. Midway through that I was given an opportunity by the India International Centre to present a lecture demonstration on the form. It was while devising that lecture demonstration that I first explored the possibility of actually performing the text. The best way to demonstrate its prowess was to actually let the text speak. Traditional Dastangoi was restricted to a single performer. The innovation I made was to rope in another actor so that we would alternate our recitations and participate as listeners to each other’s stories. Due to the neglect of the form we had very little information about the actual practice of the Art. How did Dastangos sit, how much did they move around, what were individual stylistic feats, did they have breaks, how was audience arranged, did they sing out the poetry, none of these things were very clear. Working closely with Faruqi Saheb and drawing on our experiences as theatre actors, we devised our way to putting together a one hour show. The first modern Dastangoi performance took place on 4th May 2005 at the India International Auditorium. There were a lot of Urdu writers and journalists, apart from some theatre goers and the members of the centre. From the very beginning the descriptions began to evoke a spontaneous wave of enthusiasm from the audience, soon enough the hall was swinging to wah-wahis and we were borne aloft in this vocal and passionate response to our presentation. What was brought amply home was the vitality of the texts and their ability to regale contemporary audiences. But this was still a predominantly Urdu crowd, how would non-Urdu speakers react to it? I next gave a solo performance at Sarai at the annual fellows workshop and it was a largely non-Urdu, even non-Hindi crowd and they responded to it differently, not so much to the nuances of the language as to the twists and turns of the plot. The India International Centre invited us to perform again, this time at their first annual festival of the Arts and that ratified our effort further. But in those initial moments my greatest moment of satisfaction as a Dastango came at an unusual venue to an unusual audience. I did a solo show for a group of children from the Spastics Society of India at the steps of the Jama Masjid. The children responded magnificently to the story, in spit of the noise and the crowds and the incidental group of observers who gathered to hear the story provided further joy. We have performed at Colleges, universities, at literary departments, to regular theatre going audiences and we have unfailingly met with an enthusiastic response. While the appreciation and feel for language varies from place to place, almost everybody enjoys the twists and turns of the story that are a hallmark of the oral tradition. The tropes of the story- the triumph of the hero over the villain, the combination of different rasas in one single story, the descriptions of magic, the womenspeak, the role of the sidekicks, find a ready response also because they are so much a part of our contemporary imagination through Hindi cinema which subsumed many of the Dastani variants. Films like Hatim Tai and serials like Betal Pachisi and Chandrakanta have provided a continuity of contact with the Dastani tradition. Then there are others who respond to our performance purely from a theatrical point of view, to the possibilities of drama without props, of creating tension without effects and to the simplicity of the form-two narrators on a bare stage, usually still, dependent wholly on their voices, face and gestures to create drama. This is theatrical storytelling, where it is difficult to determine where enactment stops and narration begins, or where acting takes over from recitation and mimicry from reporting. We usually perform stories from the Tilism-e Hoshruba, the most well known chapter of the Dastan-e Amir Hamza, and one which is still in print, although it is a misnomer to refer to something as a chapter which extends over eight hefty volumes. But the oral nature of the texts means that we could pick up stories from any part and recite it, repetition and circularity being important devices in oral traditions, since linearity is not the of highest priority for the rendition. The way we work in practice is to study and scan portions from the published texts, edit it down to a stand alone half an hour capsule and then hone it in rehearsals to create a story which can be performed anywhere. Simultaneously, we have tried to improvise on the form and use it to service different concerns and tastes. Having already innovated on the form by using two performers, I have tried to experiment on the content as well. At a special event to raise funds for a worker activist from Punjab whose limbs had been chopped off by upper caste landlords, we tried to create a Dastan, in the existing form, which would incorporate Bant Singh’s story, accounts of caste oppression and the situation in contemporary Punjab. The show was successful in communicating itself and its concerns even to sections of the audience which had come from rural Punjab. Earlier in 2007 we were invited by Urvashi Butalia of Zubaan Books at the Habitat Centre and Zubaan books to create a Dastangoi performance on the occasion of the sixtieth anniversary of the partition of India. We were preceded at that show by Javed Akhtar and Shabana Azmi, the Pakistani theatre group Ajoka also participated in that evening. Our presentation centred aound an allegorical retelling of some of the most memorable fiction around the theme of partition. We re-presented older stories or composed new ones like the old and groped our way to a form which was a combination of the dialogic, stand up comic, storytelling and ritual lamentation. Dastangoi is a form of storytelling, a specific form of it which has been honed for centuries by practitioners. At the same time it is also a form of theatre, which relies on intense performances by actors. It can be used to perform traditional stories, created by the Dastangos of the past, and it can also be successfully used to tell contemporary stories. As a performing art, it extends the boundaries of poetic recitation and takes it to the level of performance, as a form of narration it extends to dramatized rendition, and as a form of storytelling it extends to drama through the device of using two actors. Given the history of neglect of the form and given that there has been no known Dastango in the last seventy years, it is important to resurrect a practice that has now been lost to us. But at the same time, it is an important theatrical genre for our times, one that has the potential to transcend the proscenia and reach out to the masses. The simplicity of the form means that it can be performed with equal felicity at a street-side corner or in a proper auditorium. Instead of imposing a given product on the audience which they should passively receive, it invites them to be an active participant in the process of the creation by setting up constant dialogue with them and by resorting to direct addresses to them. 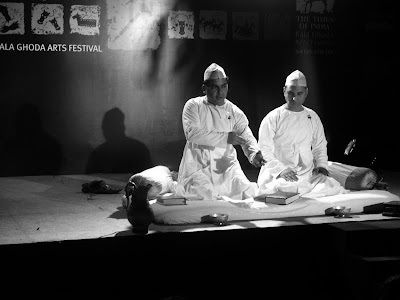 At a time when theatre in India is struggling to create new forms and to generate new contents for itself, the importance of Dastangoi as a form which contains both need hardly be emphasized. At the same time there is much to be said about the stories generated by the Dastangos of yore. It was the practice which generated texts and it would obviously have been some practice which could generate texts of this size, speculated by some to be the longest fictional narrative ever composed anywhere. The stories in themselves share all the conventions and devices used in the immense storytelling repertoire of the Indic tradition. Dastangoi shares parallels with Mahabharata and the Odyssey, as also with medieval fables and qissas but it is also a world onto its own, a teeming universe of beings, objects, spaces and realms. Ostensibly the story of Islamic conquests over non-Islamic peoples, its treatment could not be more profane or secular. The deployment of revered Islamic figures into a secular, fictional narrative, in the most casual way possible, would seem a highly revolutionary act from the perspective of today. And then to invest those figures with a life which freely breaks many Islamic taboos is further evidence that the audiences of the past reacted much more freely to entertainment than we do today. To take just one example, the Muslims in these stories drink very regularly, but they only drink ‘Islami sharab,’ and they have conjugal relations with several women, many of whom are not Muslims. The attitude to body and to bawdiness, to humor and to the realm of the possible is of a kind that is difficult to find in latter day Urdu prose. The stories can cater to high literary tastes as well as plebeian ones. With their teeming worlds, they are also a repository of social mores and norms of the medieval era. The descriptions of fairs, religious events, musical soirees, market places and the representation of all classes and castes and professions of peoples makes the Dastan-e Amir Hamza an invaluable source for learning about our selves in the pre-colonial era. The Dastan-e Amir Hamza is a highly important chapter of our literary, performative and fictional history. Its neglect is not the neglect of Dastans alone but also of several other forms of performances and creations which have today been entirely lost to us. The art of bhandgiri and its subsequent denigration is something that comes instantaneously to mind, but there was also the amazing world of Parsi theatre, of the theatrical forms of nautanki, swang, naqqali which have been systematically degraded because of the reformist zeal unleashed by colonization. Its excavation and revival is also a way of reconnecting with the self which has been rent asunder by the recasting of our minds, bodies and cultures by a process of an unequal interaction with the hegemonic west. After successfully putting Dastangoi on the map, at least in the capital, I now need to take it beyond the current level. There are a lot of directions in which we can move from here. Not all of them are attainable simultaneously but a beginning and a foray can be made on several fronts. The first and most important is to create more Dastangos. Unless many more people take up Dastangoi, the form itself would not be revived. It would remain a successful show, one with the potential to rejuvenate itself but still a solitary show. The first step in extending its reach is to create new tellers. The fund of existing stories is almost infinite and even if we were to exhaust them we could create newer stories on the given template. To put this into effect, I would need to conduct a series of workshops with aspiring performers, give them a basic training, hand them some of the texts in a Hindi transliteration and see what they can make of it. With the emergence of new Dastangos, we might have newer styles, variations in performances and eventually, even newer texts. The essence of the art of Dastangos of old lay in improvised storytelling. They could start with bare essentials and weave in the color depending on the predilection of the audience, emphasizing levity somewhere, embroidering poetic passages in other areas. We need to practice our art with some dedication if we are to reach the linguistic, literary and dramatic finesse where marvelous encounters can be conjured up on the spot. I once did a rough calculation and it turned out that if we perform for two hours everyday, day after day, it would take us nine years to exhaust the entirety of the Dastan-e Amir Hamza. We are not about to do that and for vast portions of the Dastan-e Amir Hamza to be told, it would require many more Dastangos. Along with creating new Dastangos, we also need to create new Dastans. Potentially, there is no limit to the subjects on which a Dastan can be created, I say Dastan specifically, not just a story. Anything and everything, of course, can be contained in a story, but equally one could create a Dastan about anything, global terrorism, water shortages, partition of India, 1857, all depends on the ingenuity of the teller. Only a deep immersion into an understanding of the form can allow one to create something like that, especially extemporaneously. That would require collaborative work, workshops with other practitioners, experiments with artists of other kinds, musicians, painters, installation and performing artists. We’ve had a successful collaboration with another actor and storyteller, Naseeruddin Shah, and after him we’ve trained five Dastangos who have successfully performed in Mumbai, Allahabad, and Gorakhpur. But we have to go a long way before we could recreate the magic at several levels and tell a thousand new stories and retell old stories anew. Given its near perfect marriage between literature and performance, Dastangoi is an important resource for educational purposes. It could be successfully used in schools to inculcate skills of storytelling, literary composition, narration and performance. A form of theatre where each child can be a participant as well as a creator, samples of the text need to be a part of the syllabi of Urdu and Hindi because the Dastan-e Amir Hamza contains scores of couplets and quatrains of Hindi, Braj, Awadhi and Magahi as well as speech patterns of different classes of people. As a repository of the written word it also connects us to idioms, usages, figures of speech and everyday words which have been lost to us because of the insistence on purity and a fear of the rustic. Other than creating new Dastangos what the practice most needs right now is newer audiences. While its ability to regale people in the theatre space, regular theatre going audiences, has now been conclusively proven, it yet has the ability to attract even those who are not used to watching performances in the theatre. I have sometimes defined it as high class masala and it can attract people who have been weaned purely on cinema or television because in one sense it is the precursor of cinema, full of plausible implausibilities, twists and turns of plot, formulaic plot devices and poetic interludes. Its staple content is descriptions of war, romance, convivial assemblies and magic of a kind that would make ordinary magicians pale away. It is in some ways the anti-thesis, as well as a precursor of magical-real. In spite of the over all decline of Urdu in this country, the oral performances of mushairas remain a huge draw for Urdu-familiar audiences in most parts of the country. Replete with Urdu poetry and phrases, rich with some of the best passages of Urdu prose ever written, Dastangoi has the ability to tap into this invisible but thriving audience. For that it would need to move away from the proscenia of big cities and travel to smaller cities and newer spaces. Over the next couple of years I would like to travel to cities like Patna, Lucknow, Rampur, Faizabad, Jaunpur, Bhopal, smaller cities which have a tradition of literary production in Urdu and see how small town audiences react, today, to these Dastans. At the same time I would also like to tap different audiences within cities, to actually test out today’s chowks and street corners as performance spaces and assess whether Dastangoi can work as well in these places as it once did in the past. Dastangoi’s uniqueness lay in transcending the divide between elite and popular culture and even today, as the varying response to our performance establishes, it has the ability to bridge the divide. Dastangoi sits at the cusp of performance and narration and I would like to explore its possibilities as a purely audio form. A few initial radio performances for a private channel elicited a very enthusiastic response, from the Urdu diaspora, as well as elsewhere and on the basis of that one could think of bringing out audio products based on Dastangoi. The second largest number of books exported from India today are in Urdu, which cater to a large Urdu diaspora in several continents, and Dastangoi has the ability to reach out to those audiences too. I hesitate from using the word revival in the context of our practice in the present because it is hardly possible to revive something which was deeply embedded in a particular phase of technology and culture. Dastangoi was a product of a largely oral culture and although it initially made a highly successful transition to print, it was created at a time when there were several other oral art forms in circulation. In order to unearth its mode of production, one would need to do further research on other kinds of performative and oral artifacts that were in currency in the nineteenth century. One would have to learn more about the art of bhandgiri, of marsiyagoi, of poetry as performance, of the mode of creation of Parsi plays and one would need to delve into what has been called the ‘commercial print culture’ of the nineteenth century. I also need support to simultaneously research the past of the practice. Besides, it would take a number of years, if not more, for me to simply read the existing 46 volumes of the Dastani texts, besides reading other versions of it in other languages. One of early Hindi’s most successful commercial stories is Chandrakanta, printed in 18 volumes by the same Nawal Kishore Press that printed the Hamza dastans and it freely borrows most of the tropes of Dastan, including Aiyyars, and obviously must have been popular enough to run for so long. So far, the few studies that have been of Dastans and Dastangoi have concentrated on its literary qualities and modes of production. I would like to situate it in the wider performative context and examine its relations with other forms of performance, equally neglected many of them, and in that context I am very keen to explore the dialogic relations between Dastangoi and early Parsi theatre. I use the word dialogue here with a pun, for dialogues were very central to Parsi theatre, and following it to Hindi cinema, and in some of the stories that we recite one gets a distinct feel of Parsi theatre. Parsi theatre and Dastans, both came to rest on p rint, songs and chapbooks of Parsi theatre were printed in cheap editions already by the 1870s, and how that affects form is also something that needs investigation. I would like to explore the idea of an aggregative performance, one where we build on the stories in a continuous series of performances. This could take temporal or spatial shape. We could give an extended performance, running up to many hours on a particular day and time. Alternately, we could fix a space and build up a performance over a number of days, weeks or months. Or we could devise a combination of the two. My overall idea is to delve more fully and deeply into the form, its history and its conditions of production so that I can convert what has been, sometimes, a piecemeal effort into a full time devotion. I have been a researcher as well as a practitioner all my life and my various interests in cinema, theatre, literary Urdu and Indian history, are brought together by this form. I am currently finishing a book of documents on the uprising of 1857 which is a follow up of some translation and research work I had done for William Dalrymple on his latest book, The Last Mughal. Dastangoi brings together the domains of literature, theatre and poetry in performance and, given its interplay with Parsi theatre, and cinema. My interests and experience range across those domains and I feel I am in the best position to extend the practice as well as research its past. As a performer-student or researcher-practitioner I have been fortunate thus far in having the guidance, the support and the inspiration of S. R. Faruqi, Urdu’s leading critic and writer, the winner of Saraswati Samman, who is the only one, of the modern scholars, to have fully and seriously studied Dastans and their mode of production. He is also the only person in the world who has a complete set of the 46 volumes of the Hamza cycle. We have also had inputs from Habib Tanvir, one of the most outstanding theatre directors produced by modern India. He has helped us, if I may use the term, theatricise the form better. But there are questions which we will have to resolve as we practice our craft longer, how far can one stretch the performative aspect of oral narration, what is the difference between a Dastango becoming the person he represents and an actor assuming the persona of somebody else, what modulation of speech and voice can compensate for a sedentary position, how does one use the body if one is seated, questions which can only be attempted by a more intense immersion in the form. The word Dastangoi refers to the art of storytelling, it is a compound of two Persian words Dastan and goi which means to tell a Dastan. Dastans were epics, often oral in nature, which were recited or read aloud and in essence were like medieval romances everywhere. Telling tales of adventure, magic and warfare, Dastans mapped new worlds and horizons, encountered the unseen and protected the hero through many travails and lovers as he moved on his quest. The hero’s adventures could sometimes parallel the mystic quest, at other times the story narrated a purely profane tale. In the process of telling the story the narrators freely borrowed tropes and themes from other stories, thus it was that Rumi’s Masnavi and Arabian Nights both came to contain many stories from the Panchtantra tradition. While Dastans had many principals and many stories, the story of Hamza began to stand out early on. Beginning with an unknown Arabic version the Persian versions of the story narrated the life and adventures of Amir Hamza, supposedly an uncle of the Prophet Mohammed. Marked out by fairies, djinns and prophecies, Hamza travels to different lands in his infancy and even as a young child shows great physical prowess and daring. His fame spreads far and wide and he is called by the chief minister of the King of Persia to aid the latter in his troubles, encountering many adventures, beings, species and realms Hamza remains triumphant and unvanquished, right to the end. By the sixteenth century, versions of the Hamza story had begun to circulate in India. Mentioned first in the Deccan courts, the story reached its artistic apogee in the court of Emperor Akbar. By then, specialized tellers of the story, called Dastangos had emerged. There is very little information on what the ingredients of their art were, but they were sufficiently distinct to merit a separate genre for themselves. Akbar himself was exceedingly fond of the narrative and used to recite it himself. One of the first artistic projects commissioned under him was an illustrated version of the Hamza story which became known to posterity as Hamzanama. It was a mammoth artistic undertaking which consisted of over 1200 folios, each at least a yard and a half by a yard in size, making it an unusual picture project, with the text inscribed at the back. Nothing of that size, ambition or scale was ever attempted again by the Mughal regime, attesting to the importance of the Hamza story in the medieval imagination. Some scholars have conjectured that the large size of the panels indicates their use as a kind of an audio-visual story telling, the narrators would stand behind the panels and narrate the story from the text and the panels would be changed as the story progressed, envisaging it as a form of proto-television. For the next two centuries, different Persian versions of the Hamza story circulated in India, with occasional mention of the Dastangos who performed them. There were at the same time other Dastans, sharing tropes and conventions of the Hamza narrative which, in their emphases, begin to differ from the Persian versions of the narrative. Bostan-e Khyal, composed at the end of the eighteenth century enhances greatly the role of magic in its telling of a fantastical tale. Given primacy too is the art of aiyyari, trickery, a relatively neglected feature in Persian storytelling. The first Urdu version of the Hamza narrative was published at the beginning of the nineteenth century under the aegis of the Fort William College, an institution established by the East India Company at Calcutta which was the first to edit and publish some of the key texts of the North Indian literary tradition. Alongside the ‘Dastan-e Amir Hamza,’ other Dastans were also published by the College, which included Mir Amman’s Bagh-o Bahar, a tale that was reprinted over twenty times in the nineteenth century and one which is taught to this day in the syllabi of Urdu literature. Bagh-o Bahar was selected by the colonial administrators as a text which, with suitable emendations, was used to learn the native languages, a status that was not accorded to the Hamza story. As print came to North India in the middle of the nineteenth century, stories, fables and Dastans proved to be the most important motor for the print revolution, along side religious literature. Tales such as Nal Damyanti and qissas such as Qissa-e Meherafroz-o Dilbar were printed many times over. Until the middle of the nineteenth century, however, the Hamza tradition in Urdu was thriving more as an oral performance tradition rather than as a successful print commodity. While Dastangos at Rampur, many of them migrants from Lucknow, were committing the narrative to paper, it remained in manuscript form. But already, the stories were expanding, while very few Persian versions exceeded a single volume the Urdu manuscripts had begun to extend to several volumes. Acquiring primacy too were new areas in the story, the tricksters and the magical and wondrous worlds created by sorcerers, pretenders to divinity many of them, which in their colorfulness, imagery and fancifulness were like nothing seen in Persian literature. The upheaval of 1857 turned out to be a boon for Lucknow as thousands of artists, poets and writers migrated there from Delhi, and this included several Dastangos. The first historian of Lucknow, Abdul Halim Sharar wrote in Guzishta Lucknow about the proliferation of the art of Dastangoi in the city after the mutiny. Every nobleman, he said, had made it a practice to employ a Dastango in his retinue as chowks or city squares became a favored site for performance of the art. Sharar defined it as the art of ‘extemporaneous composition,’ and said that it rested on descriptions of four phenomena, war, romance, trickery and magical artifices. The Dastangos in Sharar’s time, therefore, were not reciting a story learnt from memory, they were improvising on the bare structures which had been handed down to them. Simultaneously, after the mutiny, the Hamza story began to enjoy great currency in print. While the Fort William version had already been reprinted several times, Munshi Nawal Kishore, the legendary publisher from Lucknow commissioned another edition of the story one which, with minor changes, continued to be printed for an entire century and was last published in the 1960s. Persian versions of the story were also being printed at the same time. By that time, conventions of the Dastans were beginning to affect productions of modern prose works in Urdu. Fasana-e Azad, the first novel in Urdu, is structured like a Dastan as the picaresque narrative meanders from country to country. At the same time the tremendous success of the Parsi theatrical productions, in Hindi and Urdu, interspersed as it was with song and dance, like the Dastans, also had a give and take relationship with Dastans. Both were tied to the commercial print revolution too, as songbooks of stage performances came to be printed, exactly as Dastans created in oral performances came to find a life in the print form. In 1881, buoyed by the success of the Hamza story, Nawal Kishore embarked on a highly ambitious literary print project. He assembled some of the leading Dastangos of Lucknow and commissioned them to produce the entire Hamza narrative as it existed in oral and written records. The team of three writers Mohammed Husain Jah, Ahmed Husain Qamar and Sheikh Tasadduq Husain, joined later by others, started work on reproducing in print the virtual entirety of the Hamza tradition. The result, by the end of a labor of twenty five years, was a series consisting of 46 huge volumes, each about a thousand pages long. Each of the volumes could be read as an independent entity, or one could read it as part of the whole. We have very scanty information about the exact mode of reproduction, or production, followed by these narrator-authors. Although they repeatedly claim to be basing their rendition on preexisting texts, often in Persian, and ascribe authorship to august figures of antiquity, none of the previously existing versions they quote can be found. It is a reasonable guess that the expansion of the story from a single volume to this mammoth series was a creation mainly of the performative tradition, they were circulating in the oral realm, which may have rested on written records in the form of key or guide books which outlined the main characters and the run of the plot but the body was supplied by the narrator as he recited the story. We don’t even know whether these Dastangos dictated the stories, and they came to be written by scribes, or whether they actually wrote it in their hands. While the Hamza story was performed and recited in many other parts of the Islamicate world, in places as far away as Morocco and Indonesia, in most other places it was a part of a musical storytelling tradition. Alfred Lord and Milman Parry, in the course of their investigation of the Homeric bardic tradition, studied the Hamza singers of Bosnia and produced a groundbreaking work called ‘The Singer of Tales’ on the oral tradition. But the narrators they worked with also used musical instruments. The Indian Dastangos, by contrast relied purely on words and their art of narration to tell the story, aligning it closer to literary performance. The 46 volume Hamza cycle is the crowning glory of Urdu literary tradition and the summit of a thousand years of the Indo-Islamic storytelling tradition. The sheer fecundity of the dastan- with thousands of invented names, tools, weapons, beings, with an overflowing vocabulary- as also its immense popularity had a long lasting effect on other forms of narratives. It appropriated revered figures of the Islamic past into a profane narrative. Its treatment of themes like humor, body, macabre, eschatology, seduction, wining and dining are all of a time when public tastes and cultures in India had not been transformed under the colonial imperative. For sheer literary virtuosity, for its treatment and range of linguistic tenors, its use of metaphors, similes and all the other conventions of literary and poetic conventions, the Dastan-e Amir Hamza is an outstanding achievement. While it deals with the fantastic, the fantastic is grounded in the real and the social, so it has also been seen as a remarkable social document of the pre-colonial order. While the literary trappings appeal to high brow minds, the content of the stories, replete as they are with tales of seduction, competitive magical encounters and confrontations between tricksters and magicians could appeal to uninitiated audiences too. As S. R. Faruqi, among others, has shown, Urdu literary world and its values were recast at the end of the nineteenth century by a group of reformers who looked down on the ‘artificial and conceited,’ works of Urdu writers. Seeking to yoke literature to social reform and emphasizing purity of thought and simplicity of style, Urdu’s leading critics privileged truthful experience rather than exaggerated inventions. Desirous of mirroring western, more particularly Victorian, literary values they praised moralistic and realistic fiction and long narrative poems. Dastans, by then, were already an object of religious censure, women particularly were advised against reading them because it would corrupt them. At the same time colonial officers often found Dastans to be immoral and obscene. Added to this was the growing contempt of Urdu’s own critics who found Dastans to be childish, inconsistent, implausible and too repetitive. The only permissible fictional form for the reformers was the novel and the Dastan was a veritable anti-novel, not a precursor to it but quite a different form. Although Dastans continued to be published into the middle of the twentieth century, their popularity was clearly waning. Many of its conventions had passed into Cinema, the oral culture of which it was a product was giving place to a literary culture and the spaces where it was traditionally performed were being recast. In 1928, just a few years before sound revolutionized the Indian film industry, Mir Baqar Ali died. He was the last famous Dastango of India. The connection is not merely incidental. Reports of his performances establish beyond doubt that he was perhaps the last great traditional actor to be born in this country. Over time the genre became so neglected that today the Dastan-e Amir Hamza has completely receded from public consciousness. Few critics have engaged seriously with it, few Urdu students read them and in fact the whole set of the 46 volumes can today only be found in only one collection in the world. While their neglect as literature is inexcusable, they have also been wholly obliterated from the canon of performing Arts. As anecdotes of Mir Baqar make clear, their performance required an exceptional command over rhetoric, delivery, mimicry, ventriloquism and spontaneous composition. Moreover, Dastangoi was one feature of an oral/performative culture where the public arena was the first and perhaps the most natural site of performance. Qissagos, contortionists, sooth-sayers, faqirs, magicians, madaris, animal fights, mushairas and sundry other activities provide a prismatic context in which Dastans were composed and performed. Their skill as actors lay in commanding the audience attention at all times, an audience that in the case of a public performance was likely to fritter away at the slightest drop of intensity. This demanded acting and performing skills that range from drama to dance to mime to performance art. Rather than occupying a central place in our artistic heritage therefore, they have been sent to total oblivion. A treat for those in Gurgaon, Harayana. We're performing at Hotel Optus Sarovar Premiere, 43-47, Sector 29, City Centre, Gurgaon at the behest of Aravali Centre for Art & Culture on Sunday, Feb 21, 2010 at 5.30 pm. Would love to see you all there. Dastangos Rajesh Kumar, Rasika Dugal, Sheikh Usman, and Rana Pratap Senger will perform today at 5pm at the Marathi Bhasha Bhavan Auditorium, Kalina University, Kalina. A special childrens Dastan will be performed by Mahmood and Danish at the Kala Ghoda festival on the 14th of Feb, at 5 pm at the David Sasson library, Fort, Kala Ghoda, Mumbai. We return to Kala Ghoda Arts Festival after a hiatus of three years. Watch our new dastangos - Rajesh Kumar, Rasika Dugal, Sheikh Usman, and Rana Pratap Senger - today Feb 12 at 8 pm at David Sassoon Library, Fort, Kala Ghoda, Mumbai and then a special children's dastan by Mahmood and I on Feb 14 at 5 pm at the same venue. All journeys, being caravans of sorts, need their resting posts, their home run. Sarai is Dastangoi's home stretch. This year is the tenth anniversary of Sarai. Dastangoi started at Sarai, nearly five years ago. It started at Sarai not in any casual passive sense. Sarai's fellowship got me started on Dastangoi and it was the enthusiastic, aggressive and rapturous response by Sarai that allowed Dastangoi to find a natural home in Delhi. And Dastangoi and myself are only one off shoot of Sarai and its vision. There are hundreds of others. But since this is not the place to speak about Sarai I will let everyone find their own place in and around it. We will perform the story that first started Dastangoi, many februarys ago. Six pm, Sarai Lawns, 29 Rajpur Road. Our first screening of Peepli Live took place at the Egyptian theatre, down Main Street, the only screening venue which is located in the Park City. The quaint theatre hall was completely full and the first public screening of the film and also the premiere, went down much better than we expected. A hall full of Americans seemed to enjoy every nuance of what is a very Indian film. The Q and A afterwards, and this was true of every subsequent screening, had charged up Americans wanting to unravel complex economic issues of rural India . The festival itself is spread out over several theatres several miles from each other and they are all unconventional venues. The Temple theatre is a Jewish synagogue, the Library is located at a school, The Yarrow is a hotel, Prospector is a lodge while the Eccles, the largest of them all, is in a school premise. There are free buses to and fro the venue and helpful volunteers and drivers look after the arrangements. This year 1590 people, many of them pensioners and film buffs, have traveled, at their own expense and arrangements, to do unpaid service at the festival. They work as ticket sellers, cinema managers, ushers, ballot collectors and traffic wardens. And Park City is not the most economical of places to stay at because it is a Ski resort town. I travelled thirty miles to see a film at the Sundance Resort, a ski and recreational venue which is owned by Redford, who apparently stays there all the year round and skies when the festival ends, where you would only go to see a film. And incredibly, even that place was full. The next day we all traveled to Salt Lake City for our second screening. The place was swarming with Indians, who had mostly come to behold (and touch and harass) the producer of Peepli Live, Aamir Khan. The Indians, well, they were so excited with the star and so many of them rushed out after him that they all forgot to vote for the film. http://www.timeswellness.com, Lies and Videotape which launched Steven Soderbergh's career. At the heart of Sundance lies the Sundance Institute and the festival is only one part of its numerous activities. It runs a film lab which has seeded a large number of films, a theatre and music lab, a screenwriting lab and workshops go on right through the year for aspirants and hopefuls from all over the world. Quentin Tarantino's Reservoir Dogs was first premiered here and it is the independent film and the documentary that Sundance is known for. Low budget, cutting edge cinema has been Sundance's slogan and through most of its twenty odd years it has succeeded in living up to its motto. Although the refrain is loud and clear, year after year, that Sundance is not the same as it used to be, that it has become successful and has sold out, there is still a very large number of documentary and indie films that turn up year after year. For all its four categories, docu and feature, for world and US sections, it receives more than a thousand entries every year and there is, in addition, a Short Film section, a Spotlight section and several other kinds of showings. The programmers who watch and decide the films to be seen, and thereby set the agenda for the nature of feature and non-feature film making, are incredibly involved with films they have nurtured. John Cooper, the director of the festival, who worked in the program section for years, has been credited with returning the festival to the indie and to the experimental and incredulously he knows or knows of practically each of the two hundred odd films that screen this year. Most of Sundance staffers have been around for decades, nobody seems to ever leave this place. And this is also true for filmmakers, writers and audiences, many of whom have been coming here for years, if not decades. http://www.timeswellness.com, Lies and Videotape and Reservoir Dogs the studios have turned up every year and sometimes bidding starts right after the screening and deals are sealed overnight. Everyone hopes to sell their films but few actually get sold. What will interest the American audiences, everyone claims to know it but few can actually predict it. Of course our film, despite the obvious enjoyment of a lot of Americans, seems too remote for the Americans who obviously want another Slumdog. Three documentaries we saw slammed the American establishment very strongly. Casino Jack and the United States of Money exposed the lobbying and corruption straitjacket around Washington while the Secrets of the Tribe tore apart the powerful and influential American Anthropology establishment. But the star turn was reserved for Michael Winterbottom's adaptation of Naomi Klein's hit book The Shock Doctrine. The panel discussion afterwards included Robert Redford and the overflowing hall seemed totally in unison with the condemnation of neo-liberal economics portrayed by the film. The list of Sundance products, either as debutants here or as people who were directly or indirectly mentored by the Institute, is impressive. They include Steven Soderbergh, Quentin Tarantino, Jonathon Dayton, Nick Hornby, Miguel Arteta, David O Russell, Roberto Rodriguez, the Weinstein brothers and several others. There are filmmakers here from Greenland, from Iraq from faraway Korea and China. The thing with selling and success is that if films begin to sell rapidly and all too easily then it would seem that what is premiering here is something the establishment is totally at ease with. Once they become successful, all counter cultures, risk becoming the establishment and there is no easy way around this. So should we worship obscurity for its own sake? At the last screening on Friday, I was in conversation with an intense South African who said ours was the best film he had seen. When he walked away the lady who was talking to Anusha (Rizvi, director of Peepli Live), a part of a community of filmmakers called the Oklahoma filmmakers, turned to me and said, ‘gosh, I wish I had taken a picture of him.’ Turns out he was John Savage, of The Deer Hunter fame. Gosh, I really want to come back here. On the eve of national elections in an Indian village Peepli, two farmers, Natha and Budhia, face losing their land due to an unpaid government loan. Desperate, they seek help from an apathetic local politician, who suggests they commit suicide to benefit from a government program that aids the families of indebted deceased farmers. When a journalist overhears what the two farmers plan to do for the sake of their families, the media goes into frenzy about whether or not Natha will commit suicide. When Rakesh Singh casually tossed the idea of performing dastaans at the Magh Mela at Sangam in October 2009 to us we were fascinated by it. I’ll be very honest. I’ve never been to a Mela at Sangam. Though we’ve all grown up with Kumbh Mela deeply engrained in our cultural consciousness (for the longest time the protagonist brothers of our Hindi films would separate from each other at a Kumbh Mela) but I still couldn’t be at one ever. However, once we agreed to the proposal we started mulling over our content for the Mela performance. Mahmood wished that we perform a version of Ganga Avataran Katha, a dastanized version, and what better place to debut it than Sangam itself. We even procured a Sanskrit and a Braj version of the katha from Kamal Swaroop. However, our respective commitments didn’t spare us enough time to prepare one. Finally, we’ve had to inform Srijan that we’d be repeating one of our staple acts. Closer to the date we realized that Mahmood and Anusha won’t be able to make it to Magh Mela because of their Sundance commitment. And thus we had to draw upon our reserve strength. Rana and Usman immediately agreed to it. This would be their second gig after a brilliant debut at the Bandra Literature Festival in Mumbai in November 2009. And thus amidst a fog engulfing almost the whole of North India, our train screeched halted at Allahabad station around 5.30 in the morning on January 18, 2010, and we stepped out on to the platform inhaling the nippy Allahabad air, ready to give a first of its kind Dastangoi performance. I am sure when Mir Ahmed Ali was spinning Hoshruba with his disciples in the 19th century Lucknow some of these tales must have percolated to the banks of Ganga but whose there to verify this now. In our modern times this would definitely be a first. Utpala Shukla was a perfect hostess. She, her mother, her husband Anshu (a poet), and her sister Supriya Shukla opened their house and their kitchen for us and were perfect hosts. We spent the morning at Bal Bharti School in Civil Lines with Mr. Zafar Bakht, his staff, and the 8th standard students of his school. We talked about Dastaans, our experiences as actors, and made the kids do some theatre exercises. The enthused kids made our throats go hoarse from shouting over the din that they created with their excitement. It was an afternoon well spent. Our performance was scheduled post 6 in the evening at the Prashaasan Pandal at the Magh Mela. It was an extremely cold and a foggy day in Allahabad. In fact Allahabad had the lowest temp in the whole of north India that day. But this didn’t dampen the spirit at the Mela in anyway. It was teeming with spirit. Blaring loudspeakers, colourful tents, unusual lighting patterns, nervously patrolling police, announcements made with perfunctory diligence, smokes from tea stalls and makeshift restaurants greeted us. We were immediately subsumed in the wispy, graying ambience. The Sahota Bros from Punjab were performing before us. They’re famous for singing Paash’s poetry. And when they broke into the tune of perhaps Paash’s most famous poem “Sabse Khatarnaak,” the response from the crowd was rapturous. There were some 200 odd people in the tent. 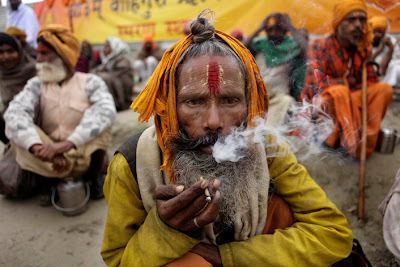 They varied from vagabond sadhus, to poor pilgrims from whichever place you wish to imagine, to middleclass Allahabadis and small town devotees, to stray onlookers. While the stage was being set up I read Paash’s poem that Sahotas had performed, and Habib Saheb’s poem “Daanishtaan mar jaane mein bhi zulm ka pehloo shaamil hai” from his play Dekh Rahe Hain Nain. Later I introduced the tradition of Dastan but the highpoint of that introduction was when a gentleman shouted at me from the audience “Please don’t bore us! Send the Dastan guys fast!” I thought this was the triumph of our art form. It’s acceptance does not rest on personalities. People are interested in the stories and not the tellers of those stories. Anyway, this interjection led to great amusement among the organizers. But I thought it was only wise to vacate the stage immediately and hand it over to Rana and Usman. Thanks and be there for our upcoming performances.